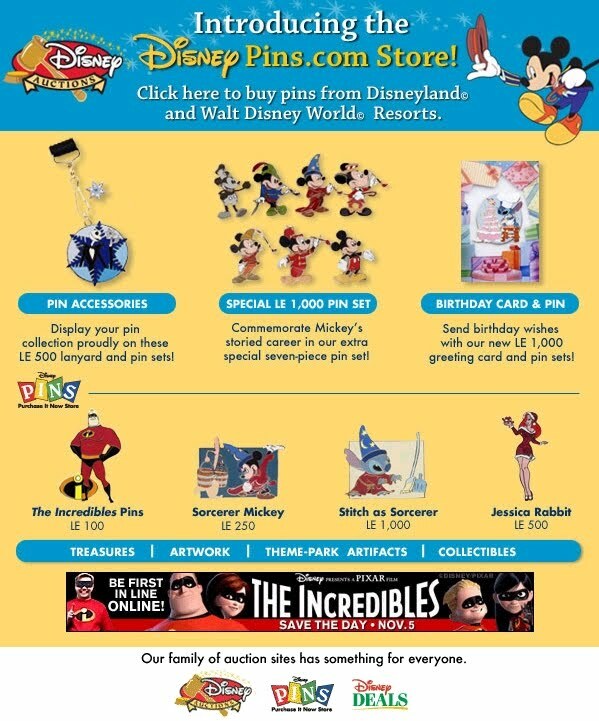 Soon after the Disney Auctions 6 Pin Set was released, collectors had no time to let their wallets rest... for the next few years. Jessica Rabbit pins flooded the market and showed no signs of stopping. The next offering came again from Disney Auctions, but was part of their P.I.N.S. line (which stood for Purchase It Now Store). This was just like the Buy It Now option on eBay, where insted of an auction, you just bought a pin outright. Jessica would now become associated with various holidays - and her first ever Christmas Series helped paved that way. Again, all pins featured the deep maroon colored glitter on Jessicas Dress and shoes. Unlike the LE 100 Set, these series of pins were limited to 500 each. Jennifer Oliver also designed the art for these pins and again are beautifully done. Jessica looks cheerful, beautiful and in the holiday spirit wearing a short mini-dress trimmed with white. 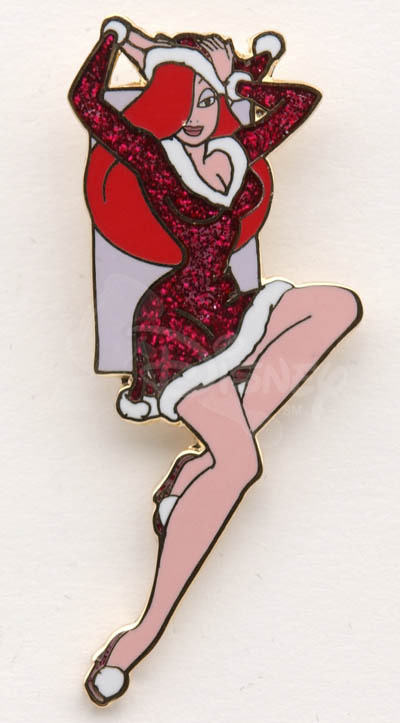 The firs pin was called Jessica Rabbit Christmas Hat - Jessica is against a purple background and is ajusting her glitter Santa hat - maybe getting ready for you to sit on her lap! 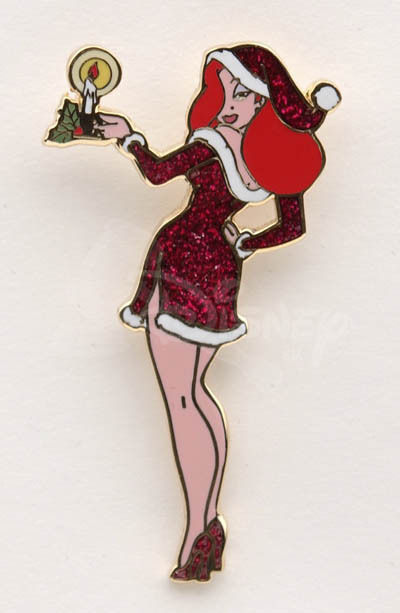 The second pin was Jessica Rabbit Christmas Candle - Jessica holds a candle and giving a come hither over-the-shoulder look. 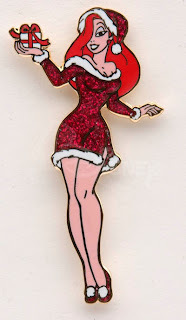 The last one is my favorite, Jessica Rabbit with Christmas Present - Jessica has a special gift for you this year. She looks great in each pose, and all of them are new. The glitter works so well here and adds alot of value to them. The Artist Proof sets were available at auction at a later time and again in gold, silver and black metal finish. 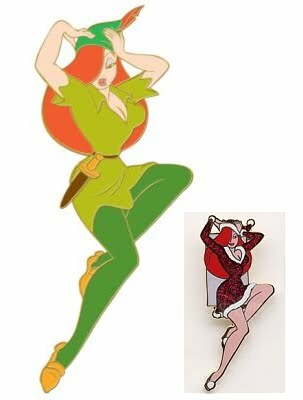 The Jessica Rabbit Christmas Hat pose was the only one to be reused, so far, for her 2007 Halloween Peter Pan costume pin. They were available for $12 each and can still be found one eBay now and then. 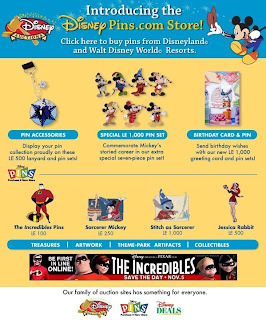 The Jessica Rabbit Disney Auctions P.I.N.S. Christmas Series gets a 5! It might seem like I'm going to easy giving so many 5's lately, but these past few items have been at the top of the list for Jessica Rabbit collectibles and are worth adding to your collection.